← Energy Efficiency – Real Usage Reductions or Simply a Mirage? One way to clean up coal generation is to increase the efficiency of power plants, thus reducing the amount of emissions per MWh. Significant improvements have been made in this area with the development of supercritical and ultrasupercritical units. And currently available emissions technology including baghouses, scrubbers, and selective catalytic reduction can significantly reduce emissions of SO2, NOx , and mercury. But no off-the-shelf technologies are available to capture carbon emissions. The potential to reduce carbon emissions comes through post-combustion technologies placed on the exhaust stack or through use of pre-combustion technologies. Post combustions technologies have proven to work in limited demonstration projects, but their operational and economic effectiveness in plant size applications appear uncertain. An alternative is to convert coal to a synthetic gas similar to natural gas through a gasification process and then to utilize it in a gas combined-cycle turbine. 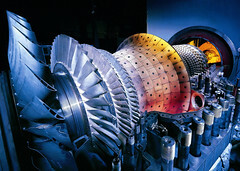 This provides multiple benefits including the higher efficiency of the combined-cycle gas turbine generation process, the operational flexibility of a gas turbine that can mesh well with other clean generation such as wind and solar, and the opportunity to capture and sequester carbon prior to combustion. Development of IGCC has been slowed by uncertain costs and lack of operating experience with only limited demonstration units around the world. But recent developments will soon provide a new window into actual costs and operational capabilities of IGCC units. Our next week’s post on Energy Currents will look at current IGGC developments in the U.S. along with developments in Europe and Asia that bear watching. This entry was posted in Electricity, Natural Gas and tagged Combined cycle, Energy Education, Energy industry, Energy Training, IGCC, Integrated gasification combined cycle, Natural Gas, Natural gas industry. Bookmark the permalink. 1 Response to A Brighter Future for Coal Integrated Gasification Combined-Cycles?